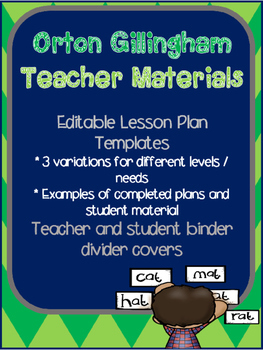 I’ve included 3 different types of lesson templates, hopefully one of them will suit your purpose. There are editable text boxes on each page for you to input your words to read etc. 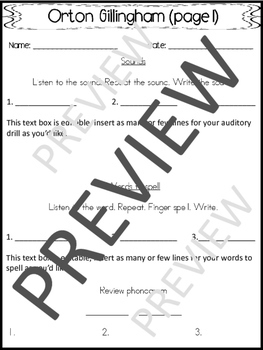 I’ve included some samples of what my worksheets look like after I’ve edited those text boxes. 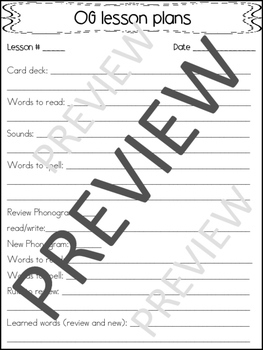 I’ve also included a few samples of what the sheets will look like once the students have completed the sheets. It’s taken me a long time to format these lesson plans into use-able templates for other people. OG is so specific to the person / group of people you’re working with, I think it’s difficult to find a one size fits all. At the very least, I hope my templates will give you an idea of what yours can look like. For the binder covers, (which are saved in a PDF file) I used conventional dividers and then glued the pictures on the front. 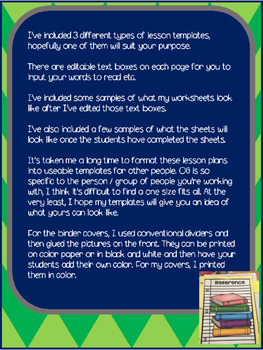 They can be printed on color paper or in black and white and then have your students add their own color. For my covers, I printed them in color.